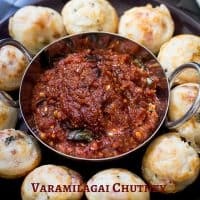 Vara Milagai Chutney | Red Chilli Chutney | Kaara Chutney Recipe is really a very spicy chutney recipe which goes very well with idli, dosa, chappathi etc. 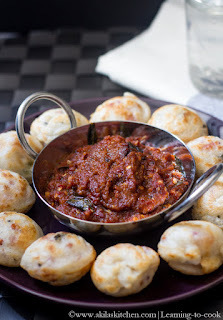 Vara Milagai Chutney | Red Chilli Chutney | Kaara Chutney Recipe with step by step pictures for your easy understanding and learning. Vara Milagai Chutney or Chilli chutney popularly know as Kara Chutney has become my favorite chutney now a days. I first tasted this chutney in my chithi’s house. She is a great cook and cooks variety of chutneys. When I tasted this chutney for the hot hot idli’s, I could not resist myself from asking some more. If you like spicier chutneys like me, then this varamilagai chutney (dried red chilli chutney ) is for you. 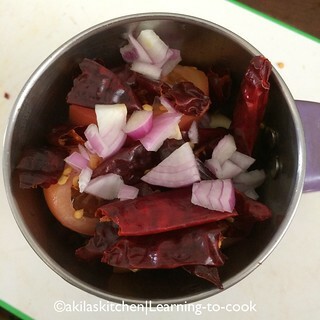 The main ingredient in this chutney is only the dried red chillies and if you cant tolerate the spiciness, little onion and tomato are added to equalize the spice. So here goes the easy recipe for the Vara Milagai Chutney. 2. Transfer them to the food processor adding little water. Add required salt. 3. Grind to a coarse paste. 4. 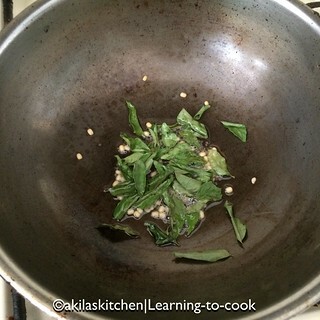 In a pan or vessel, add oil and then the tempering ingredients one by one. Fry till light brown. 5. Now add the ground paste. 6. Sauté it nicely till the extra water and raw smell goes off. 7. When it comes to thick consistency, switch off the stove. 8. 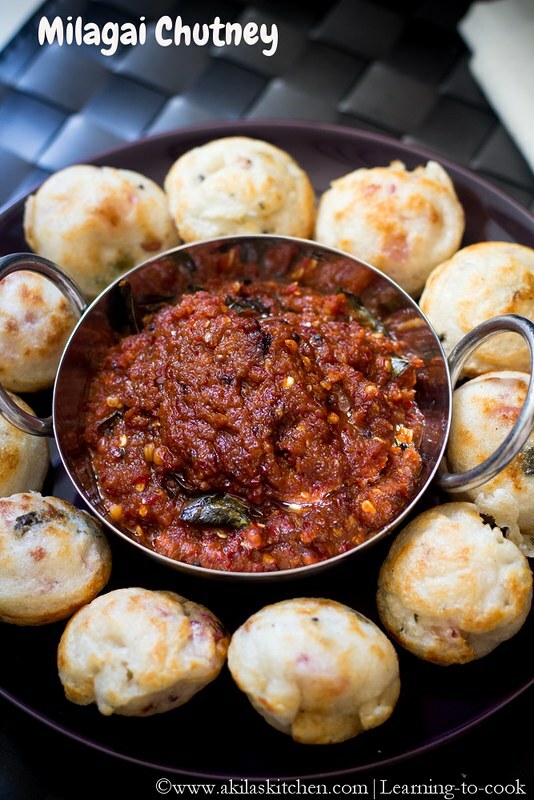 Serve it with hot idlis or dosas. I had it with hot kuzhipaniyaram. 1. Adding shallots gives more taste. 2. 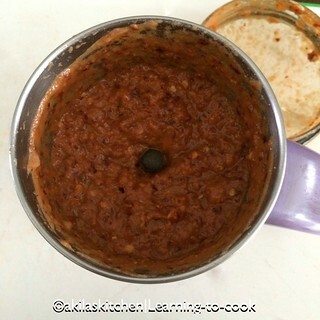 The spice level of the chutney can be increased or decreased as per the taste. 3. Gingely oil gives a nice taste, compared to other cooking oil. So try to use gingely oil. 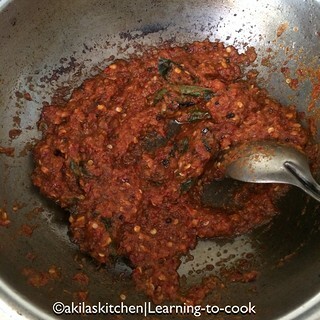 Also If you like spicier chutneys, then this varamilagai chutney (dried red chilli chutney ) is for you. 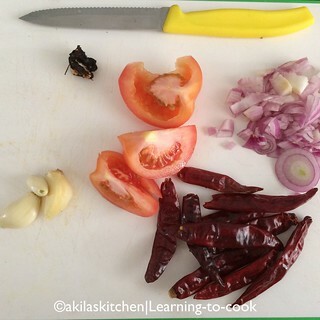 The main ingredient in this chutney is only the dried red chillies and if you cant tolerate the spiciness, little onion and tomato are added to equalize the spice. Transfer them to the food processor adding little water. Add required salt. 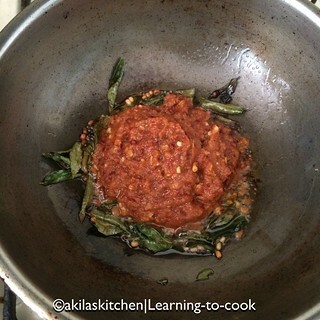 In a pan or vessel, add oil and then the tempering ingredients one by one. Fry till light brown. Now add the ground paste. Sauté it nicely till the extra water and raw smell goes off. When it comes to thick consistency, switch off the stove. 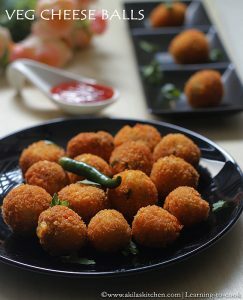 Serve it with hot idlis or dosas. I had it with hot kuzhipaniyaram. Adding shallots gives more taste. 2. 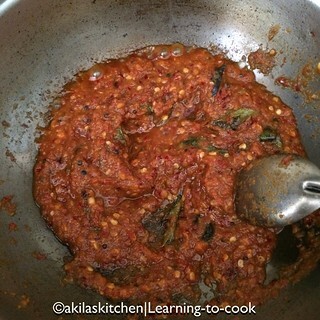 The spice level of the chutney can be increased or decreased as per the taste. 3. Gingely oil gives a nice taste, compared to other cooking oil. So try to use gingely oil. *post first published on Feb 11th 2016. Updated with recipe. Tangy and tasty chutney, would go well with dosa and idlis. such a fiery looking chutney. I should make it soon and keep it in the fridge to serve with various snacks. Vara milagai chutney looks very tasty.Lovely pictures as well.